What better way to celebrate fruits and veggies than during back-to-school! Start the school year smart and boost brainpower with Mother Nature’s best. Start with Breakfast: Studies show that children who regularly eat breakfast have better standardized test scores, better behavior and are less hyperactive than children who skip breakfast. 3 servings of dairy a day: The nutrients found in dairy help build strong bones and teeth. Yogurt is a deliciously sweet and healthy treat you can pack in your child’s lunch box. Yogurt parfait: Layer low fat yogurt, bananas, berries and crunchy whole grain cereal. Place in a to-go cup if your child eats on the run! Lunch Box Overhaul: Ditch the soda and sugary beverages. Help your child experiment weekly with new 100% fruit and vegetable beverages in their thermos. Color your crunch for lunch: Brighten up lunch with carrots or celery and light ranch dressing, or apples with peanut butter – a fun way to crunch. Get sporty: Pre-portion energy snacks for your kids as they head to sporting events, such as their favorite dried fruits like raisins, apricots and nuts like cashew and almonds. Crock pot creations: Add carrots, potatoes, onions, celery and all your favorite veggies together in a crock pot for a hearty stew that cooks while you help with homework. Blueberries: High in antioxidants, which can help protect against free radical damage and inflammation. Salmon and other fatty fish: Rich in Omega-3 fatty acids; an essential nutrient needed for the development of the central nervous system. Meat, beans & soy: Rich in iron, even mild iron deficiency anemia can affect cognitive ability. Nuts and seeds: Rich in vitamin E which has been associated with less cognitive decline as you age. In a single layer on a plate, freeze the banana slices for at least 1 hour (or overnight). 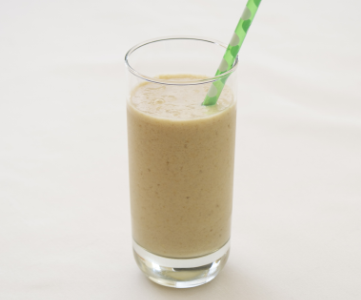 Add the frozen banana slices, cereal, milk, yogurt, peanut butter, honey, and vanilla to a blender container. Cover and puree until smooth. Pour into 2 chilled glasses.